I'm here to share some exciting news! There is an amazing new show coming called Curvy Style with celebrity stylist Timothy Snell, who works with big names such as Queen Latifah, Halle Berry, Tisha Campbell and Angela Bassett. Curvy Style With Timothy Snell is a half hour docu-series following Celebrity Stylist and Curve Connoisseur, Timothy Snell, as he works with celebrity clients and everyday women – revealing some of the industry's best-kept secrets on keeping curvy women looking and feeling their best. 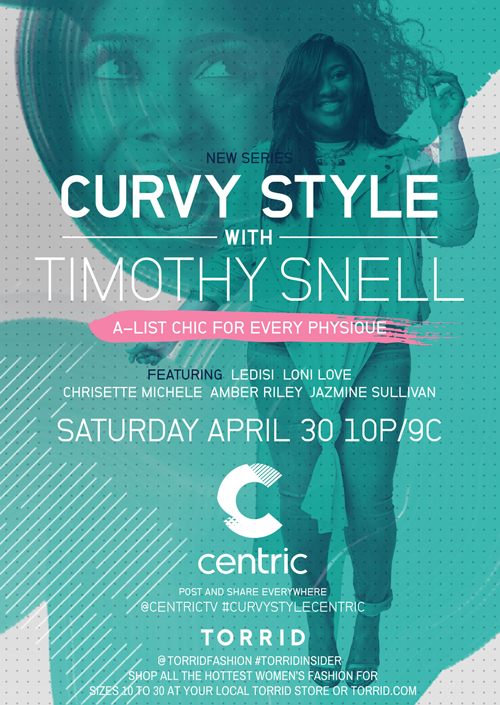 Curvy Style With Timothy Snell premieres Saturday, April 30th at 10/9 central on Centric! His show delivers A-list chic for every physique--Saturdays at 10/9 central on Centric—the first network designed for Black women. Shop all the hottest women’s fashion for sizes 10 to 30 at your local Torrid store or Torrid.com. I can't wait to see this. Be sure to set your clocks so you can tune in.